A little while ago I tried my hand at making Pistachio Butter and had a pretty epic fail. Well, the flavors were there, but the smoothness and consistency one expects from a nut butter was nowhere to be found. Ever since then I've been itching to make a nut butter again. I figured out that I didn't dry the nuts properly between the blanching and processing stages, giving me clumpy unappetizing "butter". So I decided to altogether skip blanching and go straight into processing. Lucky for me (or so I thought), peanuts just happened to be on sale that week -- a 10 ounce bag for $1. Note that these were unshelled guys. By the time I had cracked a cereal bowl full of shells, I barely even had 1/2 a cup of nuts. Frustrating and time consuming. And the hubby kept walking by and eating the shelled ones. Not cool. So in my impatient ways while at the grocery store, I decided to give in and buy jarred peanuts, ready to go. The slight slight price difference was definitely worth my time. Once shelling and blanching are no longer factors, it literally takes under 10 minutes to make your own peanut butter. Not too shabby. Especially when the food processor is doing all the work. I opted to add in some chocolate because, well, that's how I roll. Chocolate + peanut butter = one of the best flavor combinations out there, I just couldn't resist. Pour peanuts into a food processor. Process nuts 5-7 minutes, adding oil 1/2 tablespoon at a time until smooth (more or less oil may be needed). Add melted chocolate and process until fully incorporated. I ended up adding just a bit too much oil (I added upwards of 3 tablespoons) so my end result was a bit on the runny side. Still super tasty though. Next time I might add in more chocolate as the peanut butter is upfront and prominent, with just a hint of chocolate. I think I have now entered the never-ending loop of wanting to keep trying to make nut butters. I am really wanting to go back and try pistachio butter again, this time without the blanching. I just have to talk my poor little fingers into shelling those things again. I almost forgot! 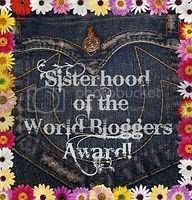 Denise from We Like to Cook has bestowed me with the Sisterhood of the World Bloggers Award! Hester from ¡Comida es mi vida y mi vida es comida! I've always thought of making peanut butter but never tried it. Now there is some real motivation, thanks! Thank you so much Danielle! You're so sweet! Wow, this looks absolutely amazing. Do you think you need the oil at all? I've made peanut butter with just the peanuts before, but I'm not sure how adding the chocolate would change the game. Thank you! Thank you! I am honored because I really enjoy reading your blog. I'm loving your but butters - I have never attempted one myself. 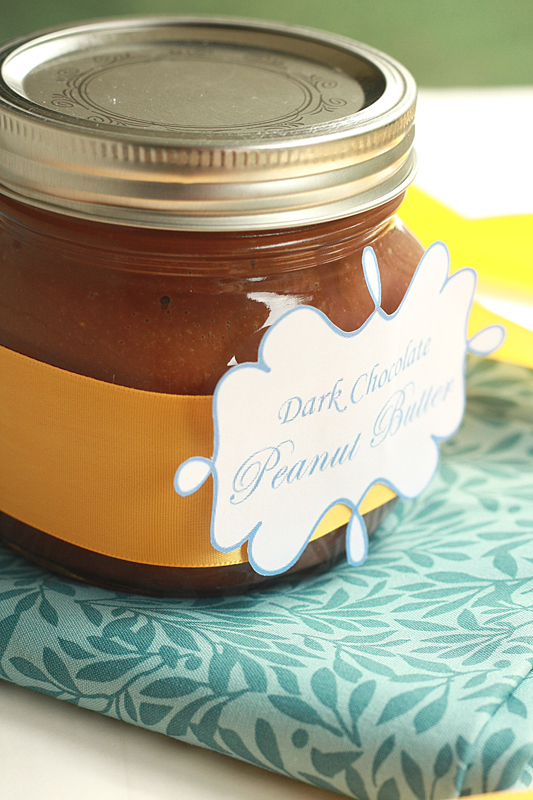 I seriously want to drench a piece of hearty toast with that Dark Chocolate Peanut Butter!! @Culinarian You may be able to get away without using oil, it depends on how dry they are when processing them. I find that the oil helps to smooth it out a little bit. I'll take a jar of this and a spoon please! Amazing recipe! I could slather this spread on anything. I've been thinking about creating a nut butter for awhile now. This sounds like a great recipe to try! What a fabulous idea and it makes such cute gifts! I'm definitely trying this. Yum! Congrats on the award, and this looks spectacular! I never even thought about making my own nut butter of any sort, will have to try this! This looks delicious and your labels are adorable. Have you ever tried doing this in a blender? I only have a 4C food processor. @Emily @ Life On Food I think a blender would work just the same, although you might have to do a bit more scraping down or possibly even split the peanuts into batches, then combine at the end when smooth to add the chocolate. You are so creative combining my two favorite flavors together like that! I've never made peanut butter - one of these days. I've been tempted to try making my own nut butters too. Adding chocolate to the peanut butter sounds heavenly! It doesn't get better than this... pb and chocolate butter... move over Nutella!! Beautiful! On another note... THANK YOU for passing this award onto me.. I'm honored, grateful, flattered! I havent tried making peanut butter at home yet, but I like that idea of adding chocolate. Wow! Thank you!! I didn't think you'd read my blog!! 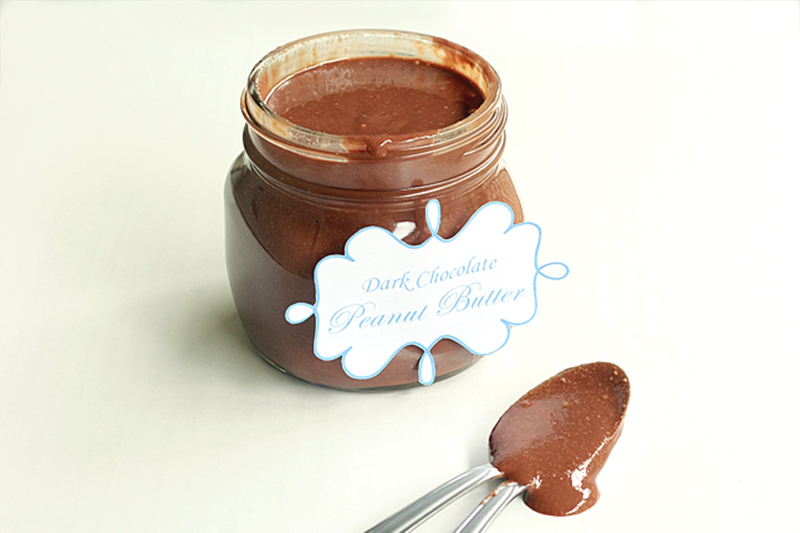 And talk about the perfect post to attach it to, dark chocolate peanut butter?! HELLO! This sounds amazing! I love homemade peanut butter, but the thought of adding dark chocolate takes this to a totally different level. I think I could eat this by the spoonful...for breakfast...every single day and be perfectly content :) PS: Thank you for the award! This looks fantastic! I'm all about PB & Chocolate! I've got to give nut butters a try, soon! How adorable is that jar and label. I have always wanted to make cute labels like that but never have. If you don't mind me being nosy, what are you using to make them? The idea of dark chocolate peanut butter has me salivating at the computer screen on the sales floor.